I have a love/hate relationship with ice cream. I love it, like a lot. But I also hate it... because I can't have it around other wise I'd eat it all.the.time. So, what's a girl to do? Usually, a cup of yogurt int he evening will satisfy my sweet tooth just fine, but sometimes I want something just a little thicker, and little more "indulgent" feeling. 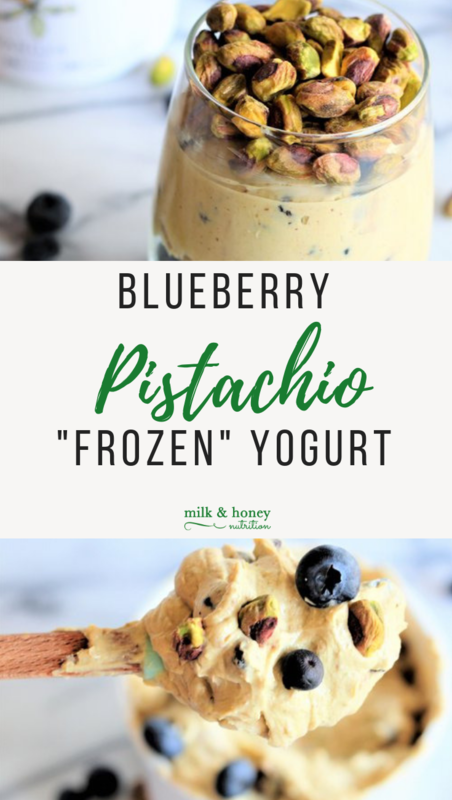 Thus, I give you this Blueberry Pistachio "Frozen" Yogurt. No ice cream maker needed, and just FOUR ingredients!! *If you are using pistachios that have been salted, I would use dried blueberries instead of fresh blueberries. Add 1 cup pistachios to the bowl of a food processor with the S-blade in place. Process for 10-12 minutes until you've got pistachio butter. (You may need to scrape down the sides of the bowl a couple times while this processes.) Once done, combine the yogurt, pistachio butter, blueberries, and remaining 1/4 cup pistachios in a large bowl. Refrigerate for 1 hour before serving. Will keep in refrigerator for up to 5 days in a sealed container.